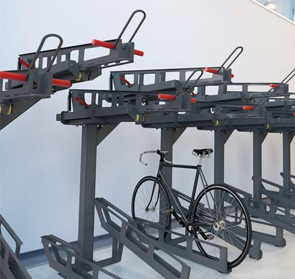 Reduce the aisle space required for accessible bike parking with the modular Dero Decker, offering the smallest footprint on the market. 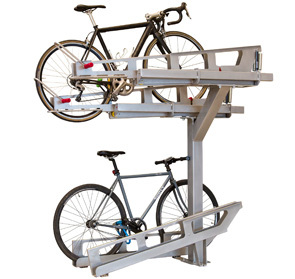 The two-tiered structure features lift assist trays that slide down inches from the ground, allowing for easy loading while minimizing the effort of lifting bicycles. Ensuring the ease of use, superior stability and assured security each tray is designed with sturdy red handle grips, hinged levers and U-Lock compatibility. Constructed with 12-gauge 4" steel uprights, 11-gauge 4" steel cantilevers and 7-gauge 4" cross bars with ultra-resilient finishes for durable indoor and outdoor performance.